We have all seen it or been there when it happens. A car draws up outside the school and children jump out, but they haven't had to undo their seat belts or get out of a child seat. Since the 18th September 2006, it has been illegal to carry children under the age of 12 or under 1.35 metres ( 4' 5") in height unless they are in a car seat or other child restraint. The table below shows a summary of the rules and who in the car is responsible for ensuring that the law is obeyed. Seat belt MUST be worn if available. A correct child restraint MUST be used. Note that it is illegal to use a rear-ward facing child restraint in a vehicle seat which is protected by an active front airbag. In a licensed taxi or licensed hire car, if a child restraint is not available then the child may travel unrestrained in the rear. This is the only exemption, and it has been introduced for practical reasons. Child from 3rd birthday up to EITHER 1.35m in height, OR 12 years old which ever comes first. 2. For a short distance for reason of unexpected necessity (not a planned or regular trip). 3. Two occupied child restraints prevent fitment of a third. Child over 1.35 metres, or 12 years old (unless the child is 14 years old or older - see below). The table below summarises which child restraint type is suitable for a range of child weights. However for specific information in relation to your child, you should refer to the manufacturer's instructions for the suitability of the restraint for your child. Manufacturers may use different names and some products cover more than one weight range. 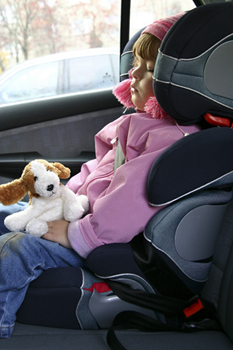 It is illegal to use a rearward facing child restraint in a vehicle seat which is protected by an active front airbag. The only options are to disable the airbag, place the seat on the back seat, or as a last resort use a forward facing child seat (for young babies rear facing seats provide a high level of protection in the event of an accident so these are the best types of seat to use). Seated passengers aged 14 years and over MUST use seat belts where they are fitted. At the moment there are no rules about children younger than 14 wearing belts, except that children under the age of 3 on front seats must use a baby / child seat. More information about child car seats can be found at the childcarseats.org.uk website or on the thinkroadsafety.gov.uk website. We have also found information about making your home childproof which you may find interesting on the UK Home Information website. Please note that the rules regarding car safety seats are correct at the time this article was written, if you are in any doubt please check with your local councils' road safety department.